Disclosure: This is a compensated post in collaboration with the Ashland Chamber of Commerce. As usual all opinions are my own. Thank you Ashland Chamber of Commerce for making NJB possible. We are in Ashland today getting started on this perfect weekend! The sun is shining, it’s over sixty degrees. I’ll be enjoying wine, cheese, music, lovely people, and my belly is waiting to be filled with delightful treats. Follow along while I share live tweets, Facebook updates, and Instagram photos of the amazing events all weekend long, and getting jealous is totally understandable. I apologize in advance. Next week I will follow up with details, and my favorite dishes. In case you missed it, here is the first part of the chef interviews. 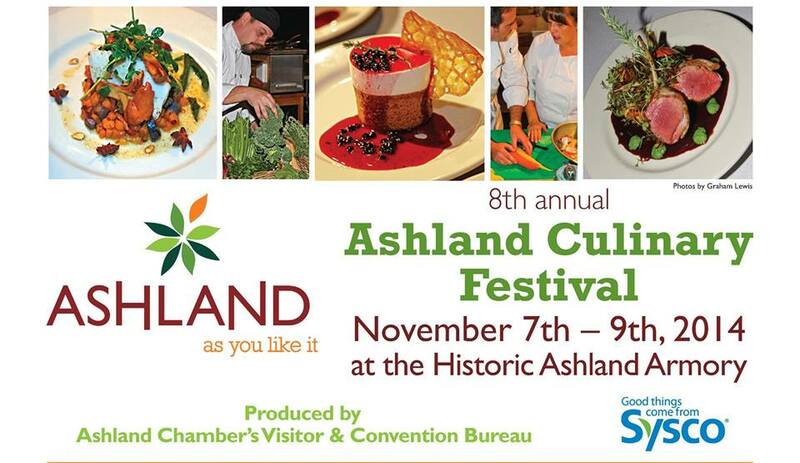 Today we are sharing the next competitors for this weekends Ashland Culinary Festival. Please welcome Noah Edwards from Smithfields, Dusitn Farley from Porters- Dining at the Depot, Anna Hogan from Salame, Dawn Strickmeyer from Black Sheep Pub & Restaurant , and Will Shine from Martino’s Ristorante. Again, this will make you hungry, sorry! 1. What is your favorite meal to cook or eat on your day off? My favorite meal to cook on my day off is the clam linguine dish my dad taught me to cook when I was in high school. 2. Why do you compete in the Ashland Culinary Festival? I am competing in the festival for fun. It’s that simple. 3. What is the most popular dish at your restaurant? OR What is your favorite dish you prepare at your restaurant? The most popular dish at Smithfields is our 12oz. ribeye with horseradish mash, blue cheese butter, worcestershire sauce, and corn meal dusted onion rings. But my favorite thing to do, is to load the smoker up with 100 pounds of BBQ spice rubbed meats. My favorite thing to cook on my day off: I love to make spaghetti and meat sauce with my son Gabriel. I like to compete because: It feels rewarding to show off my culinary skills to the public. My favorite dish to prepare at Porters is: Coriander-black pepper crusted coulotte steak with housemade Worcestershire sauce,smoked wild mushroom-potato hash and bacon braised kale. Favorite thing to eat on my day off is hash browns made by our Sous Chef, Devon Foster. The best. I compete because it’s fun. Most popular dish is our burger, or my grandmas meatballs. My favorite food to eat on my day off is choucroute a l’alsaciene (sauerkraut and meat). I compete in the competition because it is good promotion for the restaurant. It is also nice to see the other chefs in the community. My favorite dish at The Black Sheep is the pub board. There are 3 choices: meat, fish, or a veggie variety. All 3 feature pickles and charcuterie that are made in house. What I really enjoy most when I’m not at work and consider my comfort food is fried chicken. Apart from that I love cooking with my boys and enjoy anything they want to make. I love teaching my boys and having them help me in the kitchen. I enjoy competing for the competition aspect, but also because it’s a great way to get the local Chefs together and let the public know that there are many talented Chef’s in our local area. I enjoy the competition and have fun and always am excited to see what fellow Chef minds come up with under the pressure of not knowing. It’s also good publication for the local restaurants in our area. Especially to win and make it to the bite of Oregon. Over the summer we decided to add lobster to our menu. We came up with three dishes. One was being requested by our regulars that we put back on the menu. Lobster raviolis. In addition to the raviolis we added a lobster gnocchi and a lobster risotto. These dishes along with our other seafood selections have to be my favorite on our menu. People ask me my favorite things to cook and I always answer seafood and fresh fish along with fresh local berries. Seafood is such a great ingredient. From it’s delicateness, to being able to take on great flavors. Hungry now? I know I am. I love these answers, and appreciate the time the chefs took to answers these questions. I am very excited to see what they come up with this weekend. I’ll report back with all the goodies! It’s always interesting to hear the inspiration and preferences of chefs. They really are artists. I love attending food festivals and interviewing chefs! Sorry but Ashland where? Oregon? North Carolina? Good call, thank you. Ashland, Oregon. I love Ashland! We stay there every time we drive up to Portland, a few times a year. I had no idea they had a Culinary Festival. I’m putting it in my schedule for next year!! Isn’t it the cutest town ever?!! I loved it, it was a great festival. So fun to hear what chefs like to eat and what their favorite thing to prepare is! Nice to see that it’s not always something over the top. I’ve heard great things about this festival! It’s always funny to hear about professional chefs’ cravings…usually something much simpler than what they’d prepare at work. My thoughts exactly! I am very happy to be a part of this. It’s always interesting to see what professional chef’s prefer. I totally agree, it’s usually down home cooking!